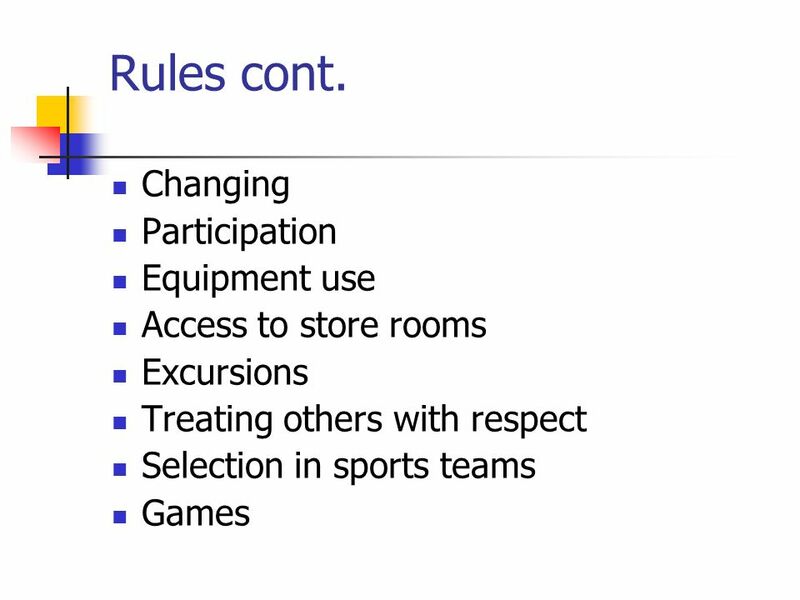 2 What do middle years students need from a Physical Education experience? 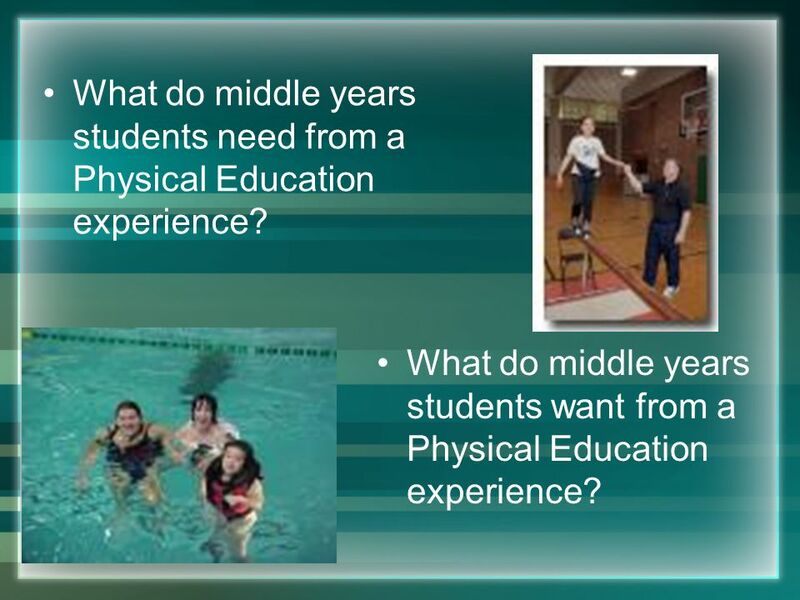 What do middle years students want from a Physical Education experience? How were they different? 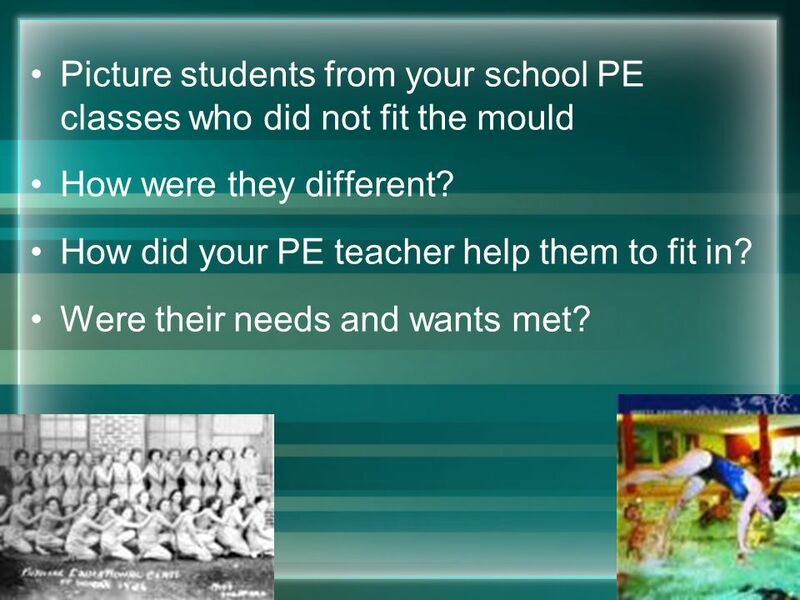 How did your PE teacher help them to fit in? Were their needs and wants met? What will they look like? 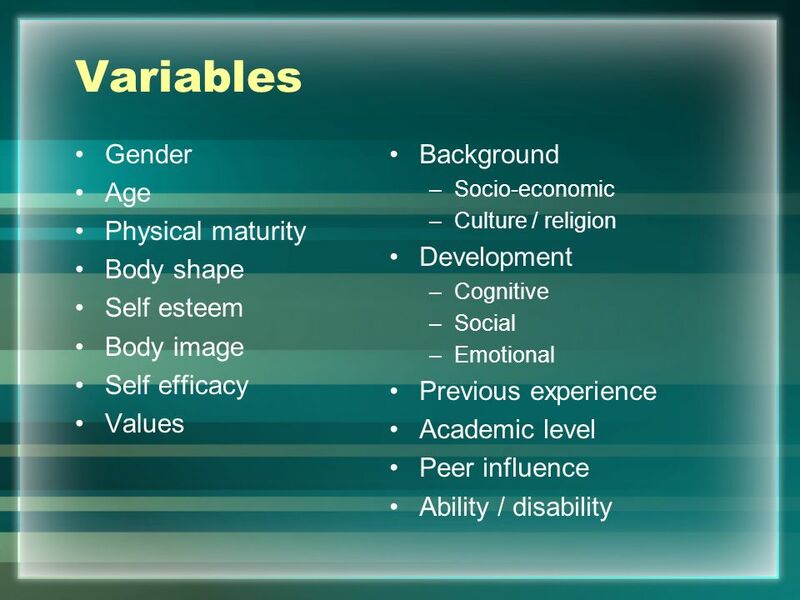 What will be their special needs? 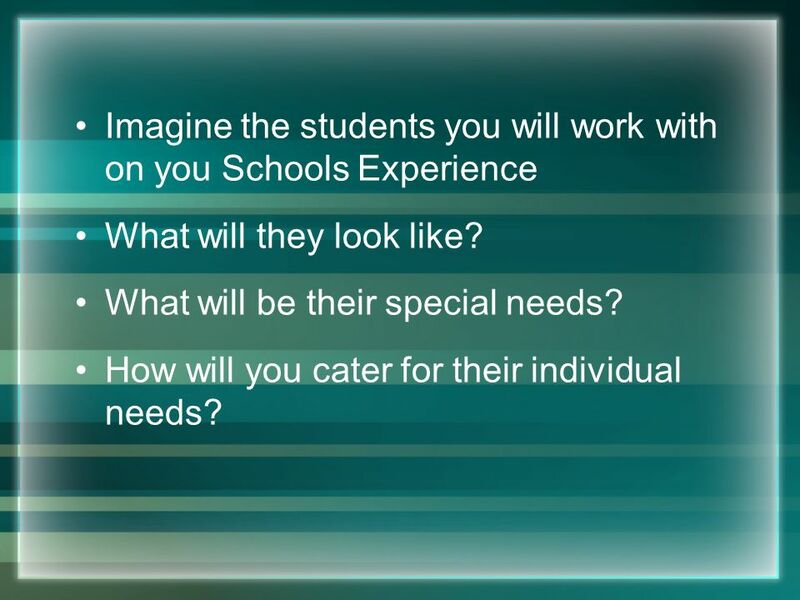 How will you cater for their individual needs? 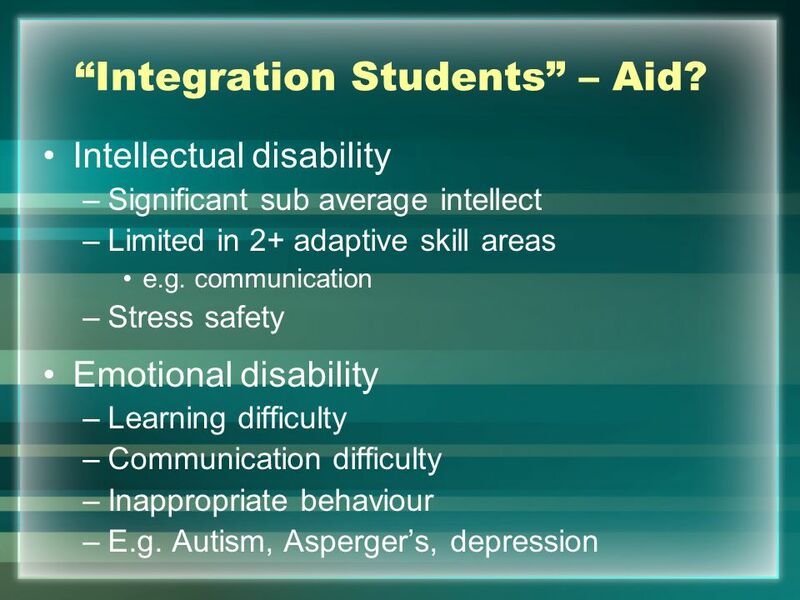 9 “Integration Students” – Aid? 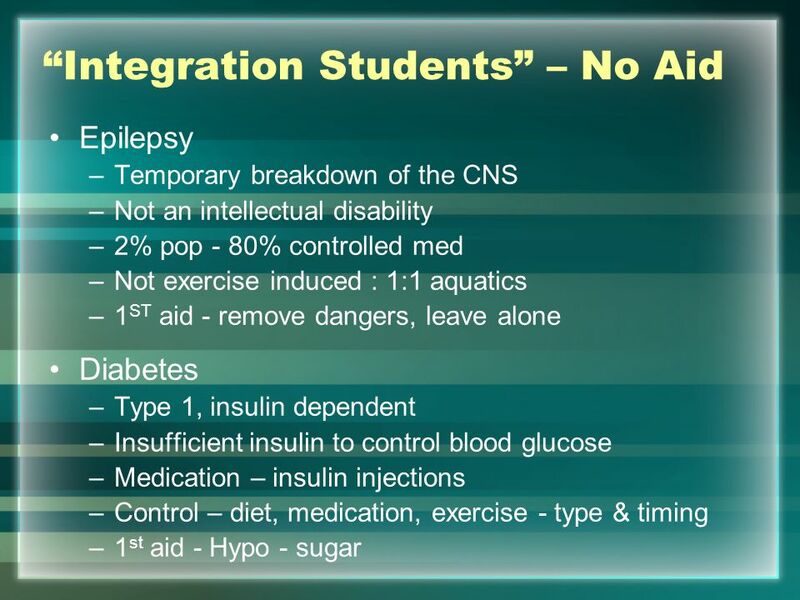 10 “Integration Students” – Aid? 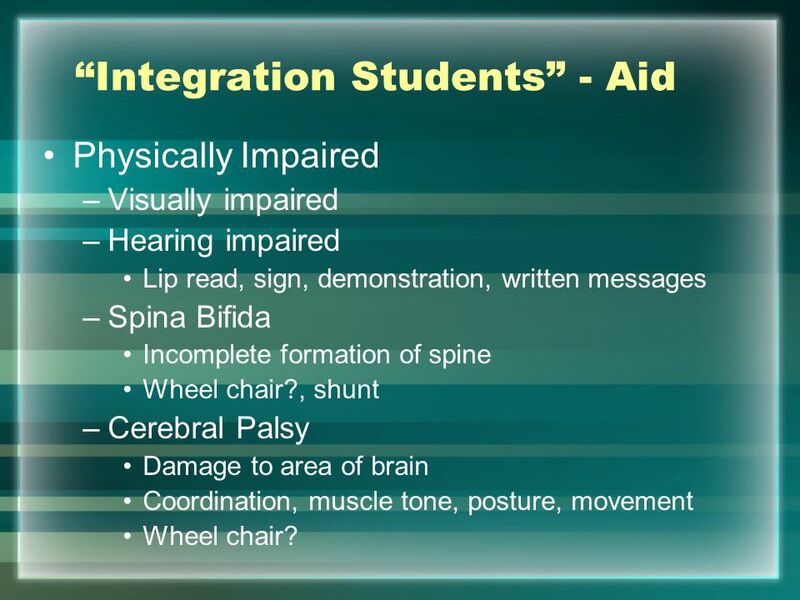 Physically Impaired Visually impaired Hearing impaired Lip read, sign, demonstration, written messages Spina Bifida Incomplete formation of spine Wheel chair?, shunt Cerebral Palsy Damage to area of brain Coordination, muscle tone, posture, movement Wheel chair? 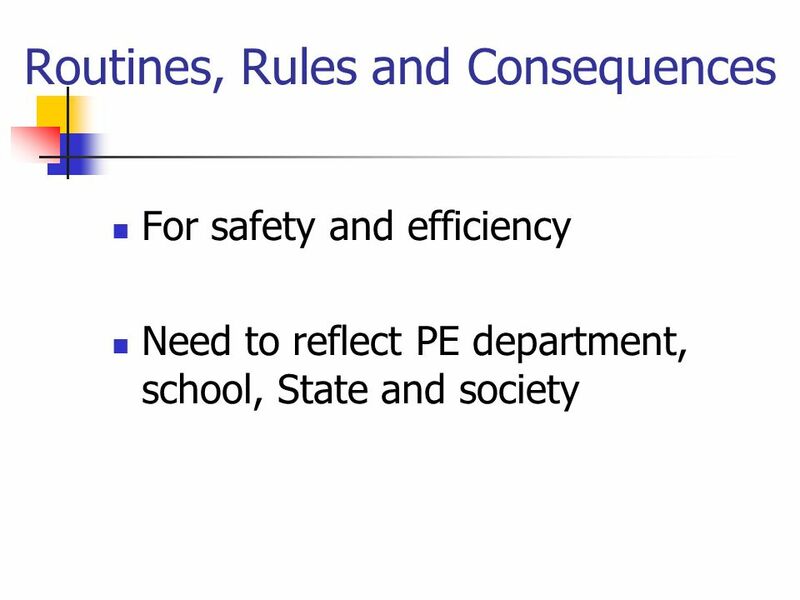 17 Routines Procedures to ensure the safe and efficient running of the class List all the areas where routines are needed to ensure the smooth running of PE class. 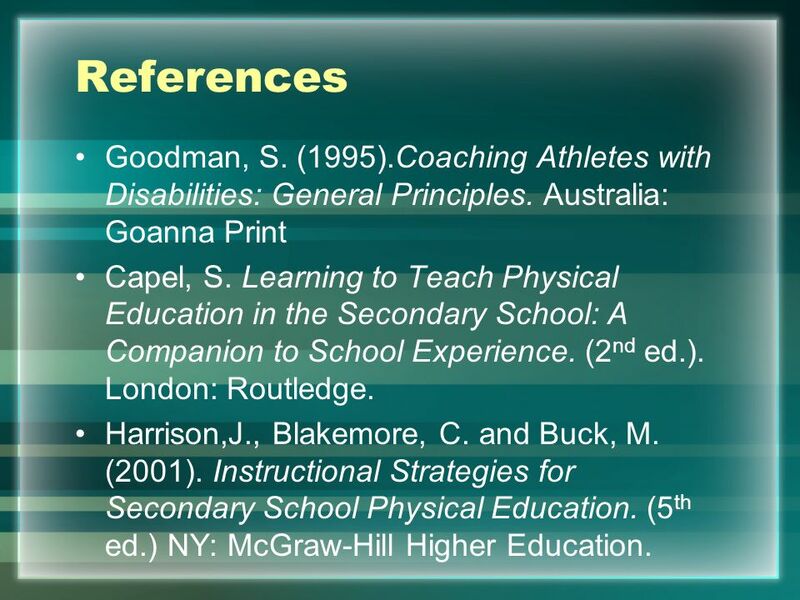 23 References Goodman, S. (1995).Coaching Athletes with Disabilities: General Principles. Australia: Goanna Print Capel, S. Learning to Teach Physical Education in the Secondary School: A Companion to School Experience. 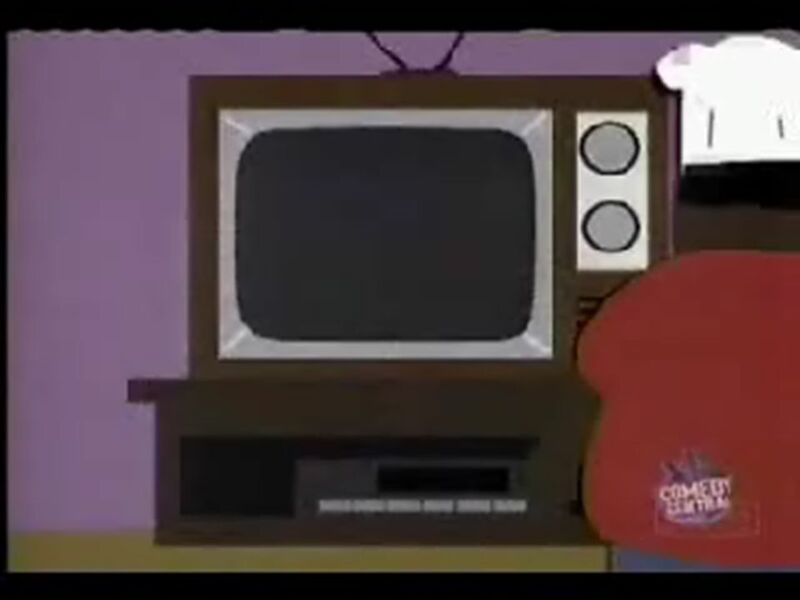 (2nd ed.). London: Routledge. Harrison,J., Blakemore, C. and Buck, M. (2001). 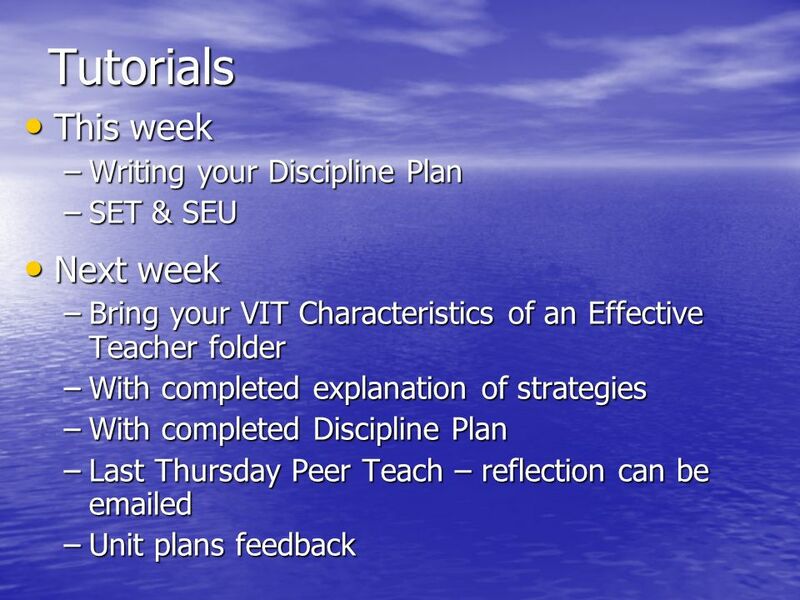 Instructional Strategies for Secondary School Physical Education. (5th ed.) 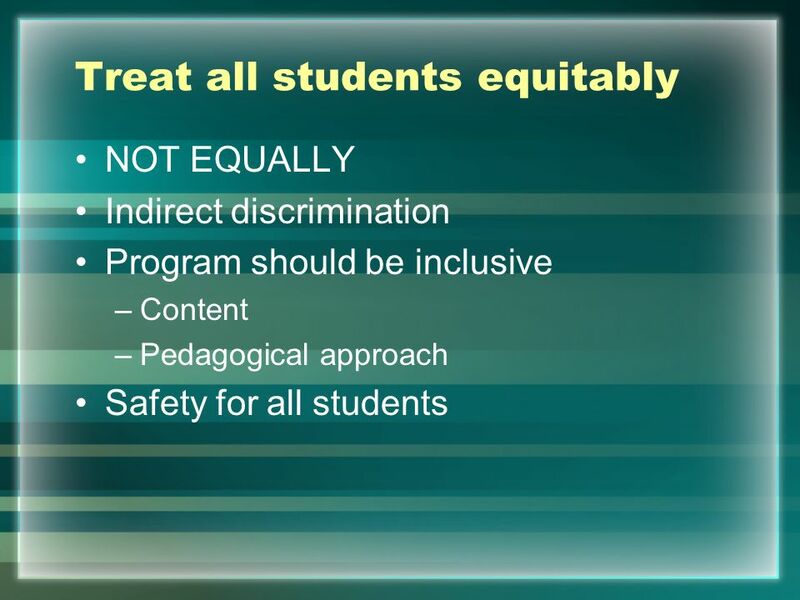 NY: McGraw-Hill Higher Education. 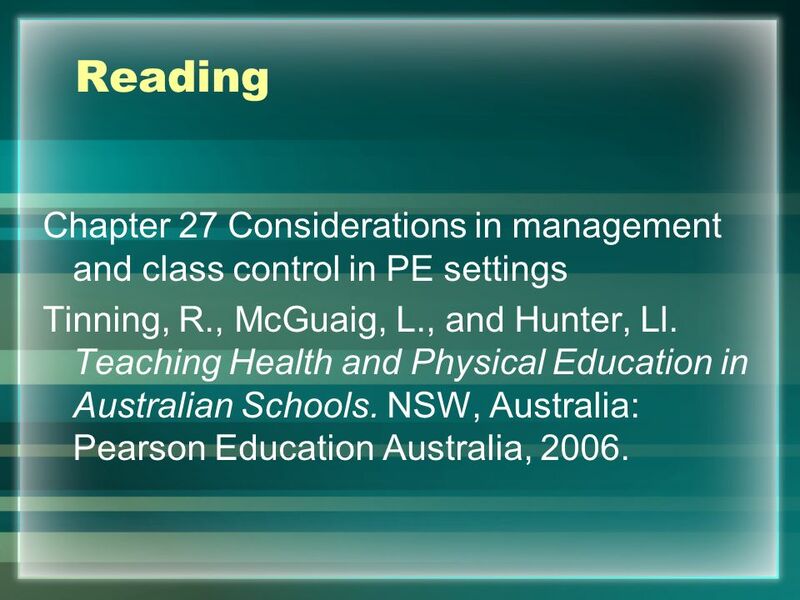 24 Reading Chapter 27 Considerations in management and class control in PE settings Tinning, R., McGuaig, L., and Hunter, Ll. 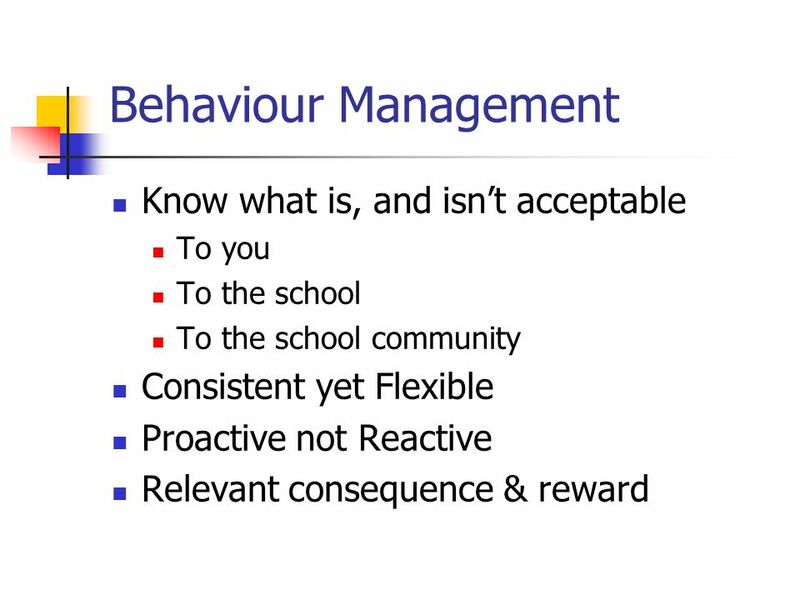 Teaching Health and Physical Education in Australian Schools. 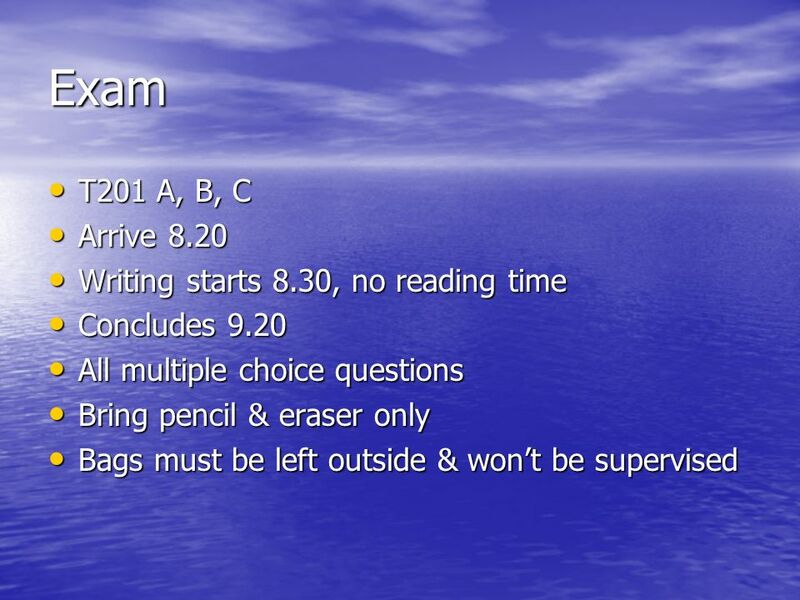 NSW, Australia: Pearson Education Australia, 2006. 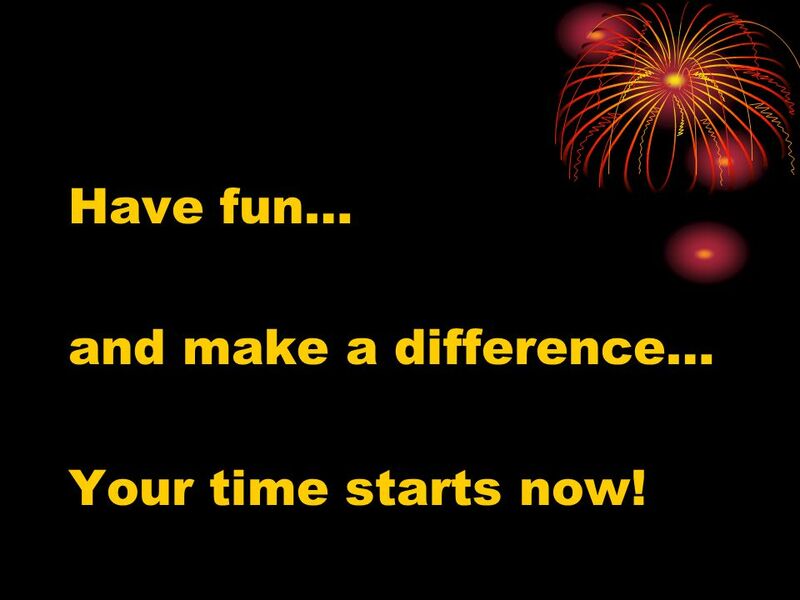 26 Have fun… and make a difference… Your time starts now! 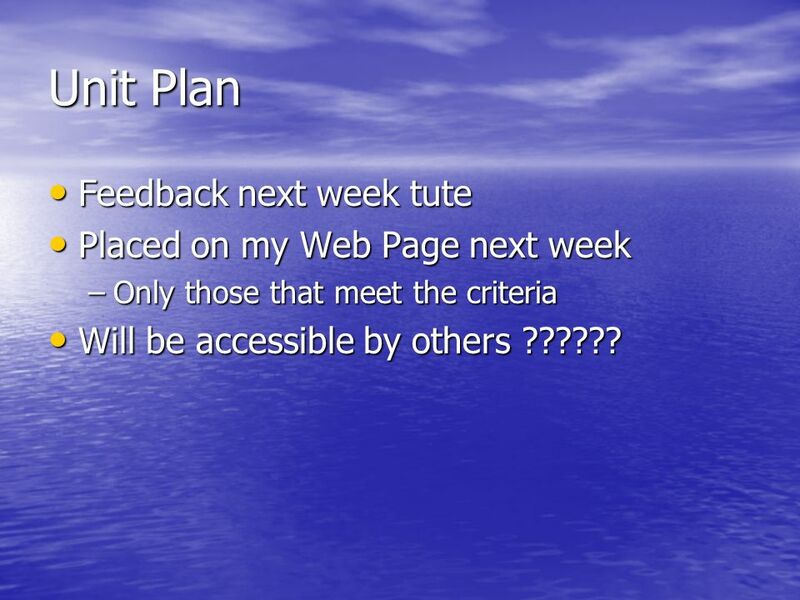 Only those that meet the criteria Will be accessible by others ?????? 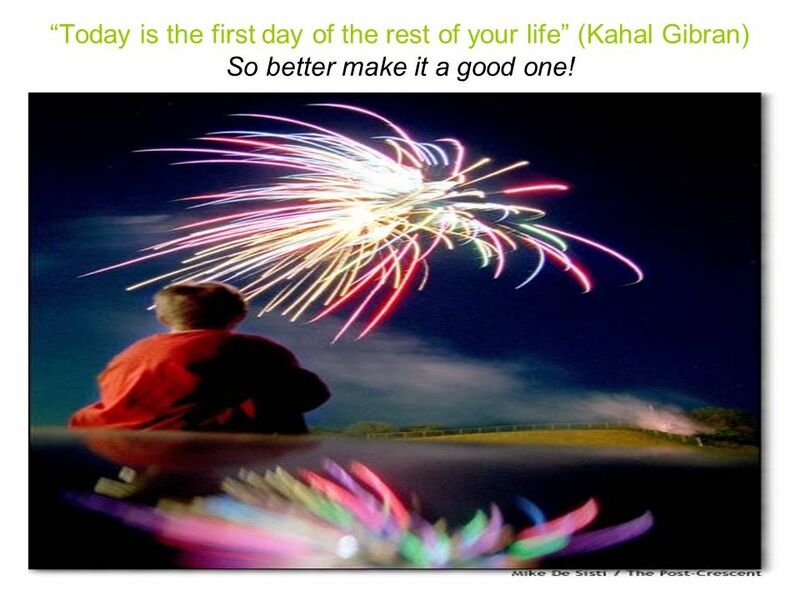 31 “Today is the first day of the rest of your life” (Kahal Gibran) So better make it a good one! 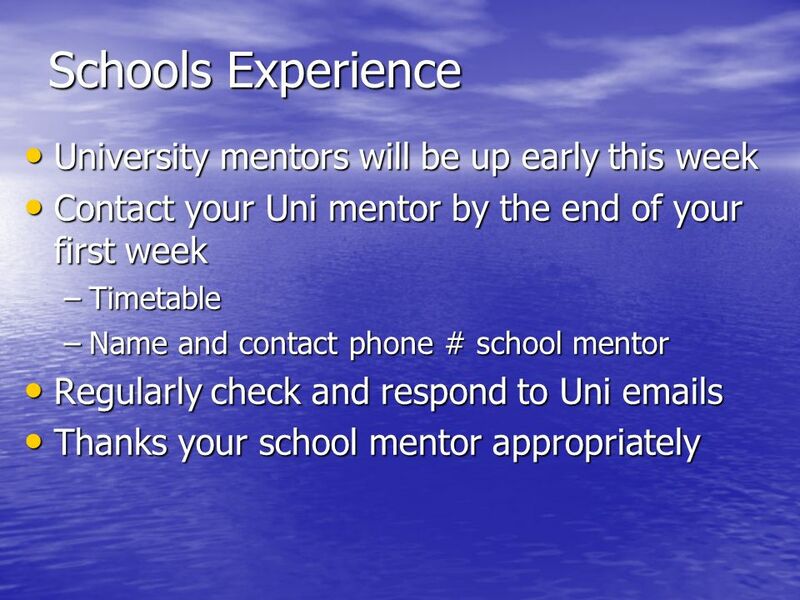 Download ppt "Meeting the Needs of all Students"
School Sports Coaching Apprenticeship SEN and disabilities. 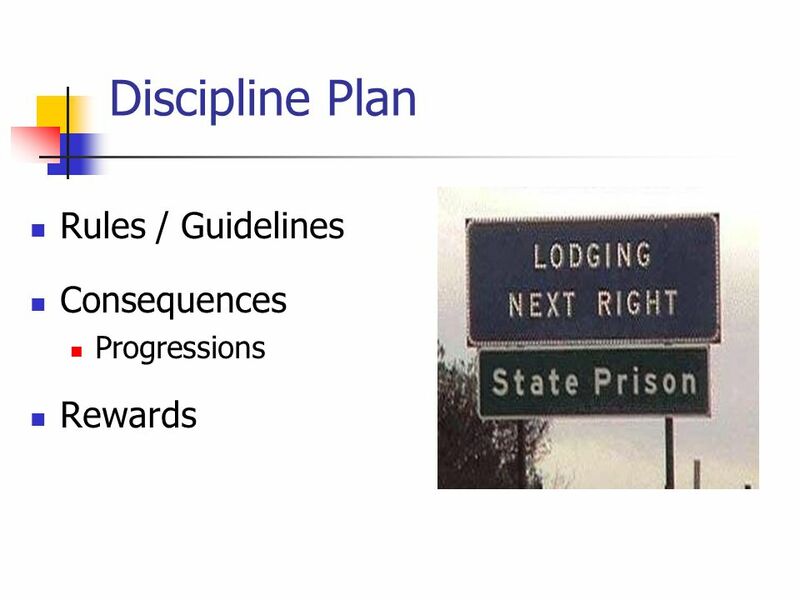 Please have out your pro/con list. 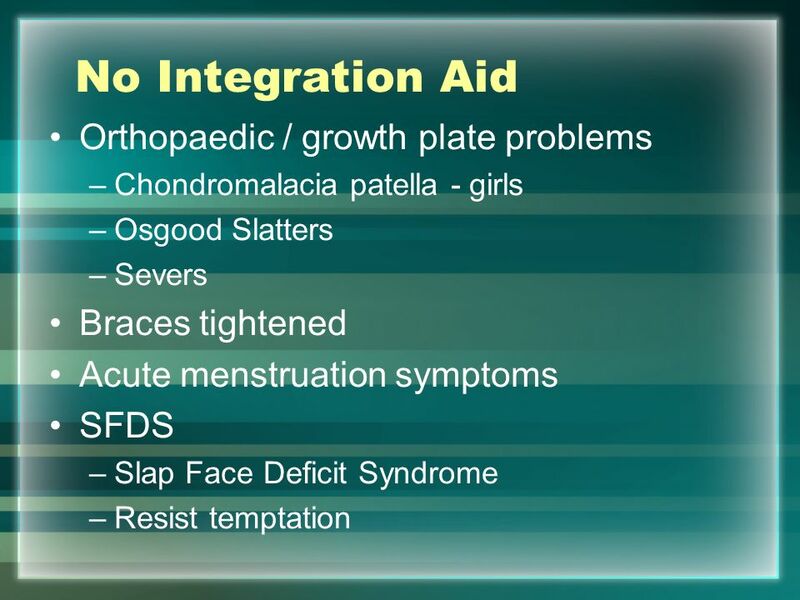 As a table group, pick the top 5 reasons for each side. Write on a white board. Choose someone to share responses. 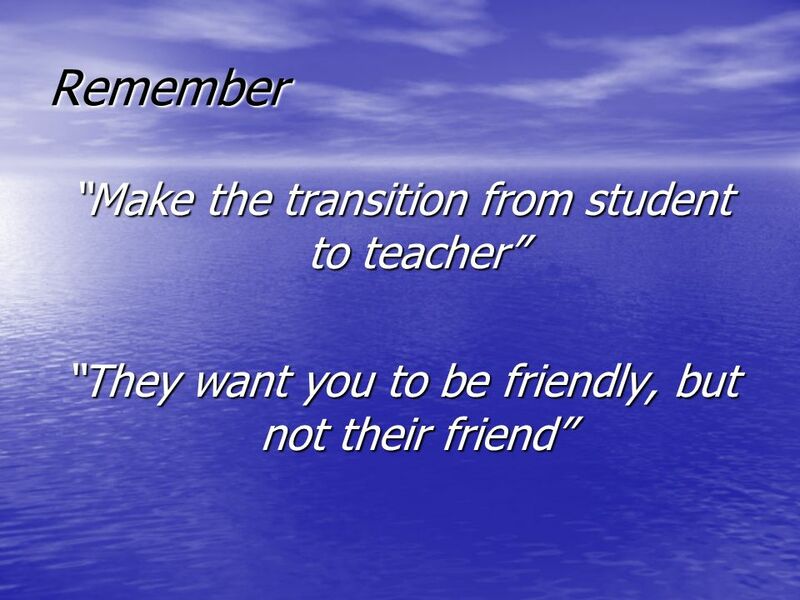 REGULAR EDUCATION STRATEGIES TO ENHANCE THE LEARNING PROCESS. STAFF TRAINING WEEK Disability Service Malmö University. 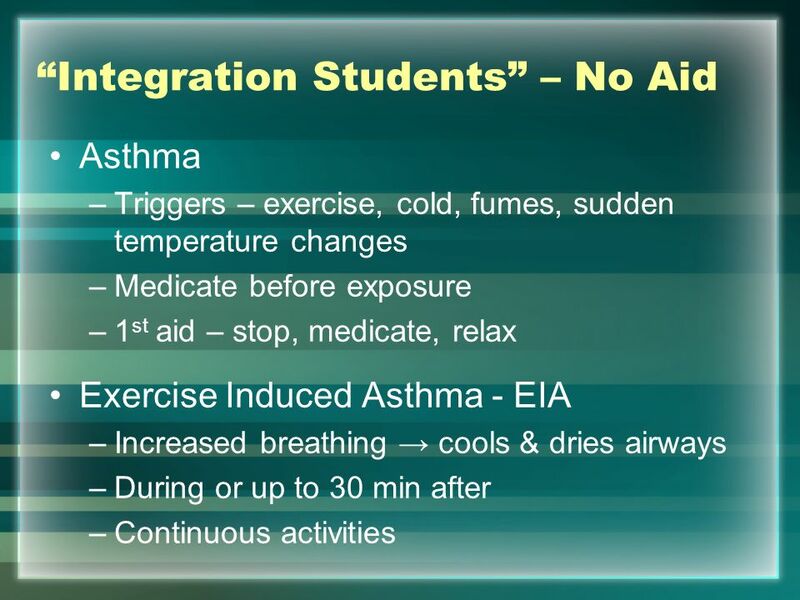 Chapter Thirteen: Special Topics in Safety, Nutrition, and Health. 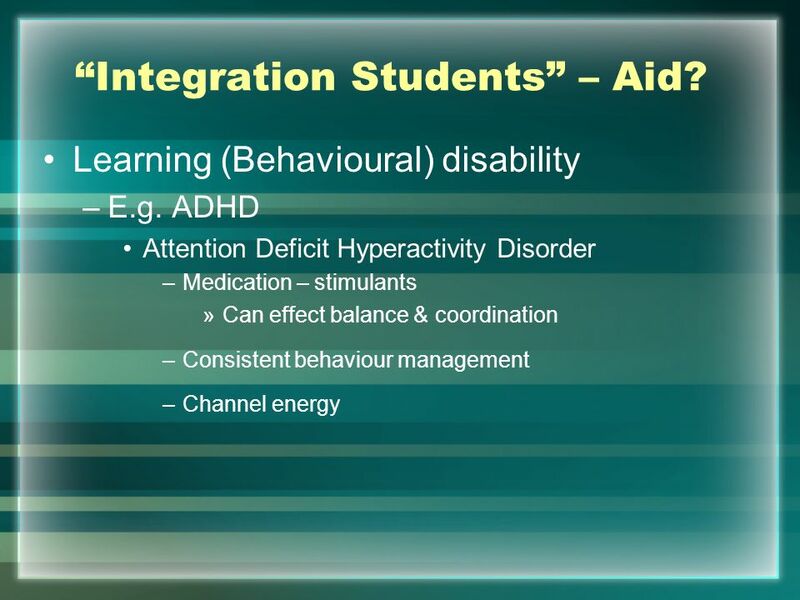 Autism and Asperger’s Syndrome How to make accommodations in academic assessments. By Reginald Amey. 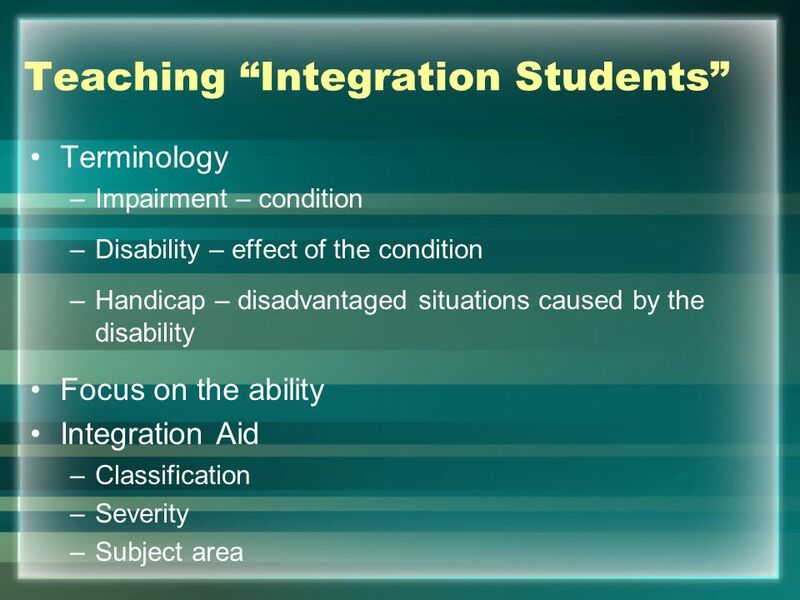 Intellectual Disabilities Students with intellectual disabilities are classified as MID, MOID, and Sever/Profound MID- Mild Intellectual. 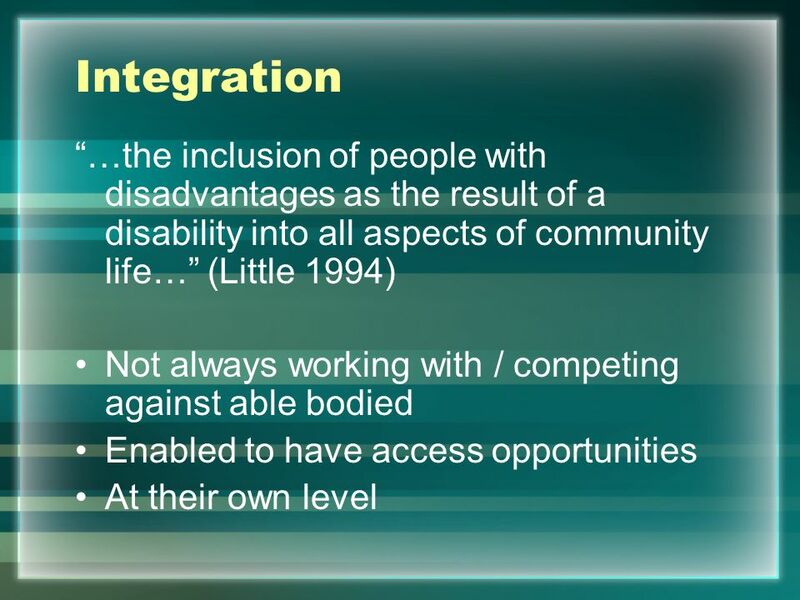 Definitions, History and Legislation for Change  Individuals with disabilities are restricted by access, opportunity and attitudes.